John Teti and I had a little chat to kick off our Friday thread this week. We started off talking about the clever little touches that have kept John and his wife coming back to Super Mario 3D World for some five months, and we ended up talking about how 3D World is emblematic of an artistically reinvigorated Nintendo, restoring some whimsy and wackiness to its games. In between, there was a digression about John’s undergraduate thesis project, which was devoted to Final Fantasy. It’s a journey. As always, share your weekend gaming plans in the comments. Matt Gerardi: What are you playing this weekend? John Teti: I’m swooning over South Park: The Stick Of Truth lately. I’m also still playing Super Mario 3D World with Anna. We got all the stars and gold flags. MG: Oh, wow. What about the stamps? JT: Yup. Now we’re going back and getting flag pulls for all the characters. MG: Holy crap. That’s dedication. JT: The fun is just bottomless. There are so many details that we discover as we go through again and again. I haven’t “100-percented” anything in a long time. I can’t remember the last time. Final Fantasy X, I guess, but that’s partly because I was writing my thesis about it. MG: It’ll take us off-topic, but I have to ask, what was that thesis about? JT: It was about the narratology of Final Fantasy. All the different ways that those games build narrative, big and small. There was also a chapter about localization, which was fascinating in itself—the localization, not the chapter. A lot of people do their undergrad thesis and forget about it. And I did the same. But a couple of years ago, I dug it up again and saw that many of the principles I bring to game criticism now had seeds in that thesis. That made me proud. Education does matter! MG: Having finished my education not too long ago, I’d say that’s good to know. What kind of seeds are we talking about here? JT: I don’t want to get too deep into the weeds, or the seeds, but looking back, I think this thesis was the point at which I started to realize that video games transcend traditional ideas of media and don’t fit tidily into this box labeled “medium” that we’ve used for the past half-century. I don’t talk about this too much, but I don’t even think of games as a medium. Sometimes I think of them as an art form—which is pretty close to a medium—but more often I consider “game” as this polymorphous idea, or better yet, a force that blurs familiar structures of thinking and appropriates wildly from different corners of the culture. The way I conceive “game” depends on the context. I’m not talking about this stuff with the rigor I’d like, but you know, we’re just chatting here. MG: You mentioned being impressed by all the little details in 3D World that you noticed when revisiting the levels. Do you find that it’s the small stuff that typically hooks you? JT: That’s fair to say. Or more accurately, it’s the small stuff that keeps me coming back. You know as well as anyone that before 3D World, I’d had it up to here with the Mario games. There have been a handful of lackluster 2D ones, and I felt that Nintendo had run the thing into the ground. (I say “Nintendo” like it’s this monolithic entity, but I should note that there are many development teams within the company, and the Tokyo office responsible for 3D World has turned out more than its share of good work.) So there couldn’t have been anyone less predisposed to love this game. But one big thing impressed me about 3D World out of the gate, which was how well they designed it for multiple players. 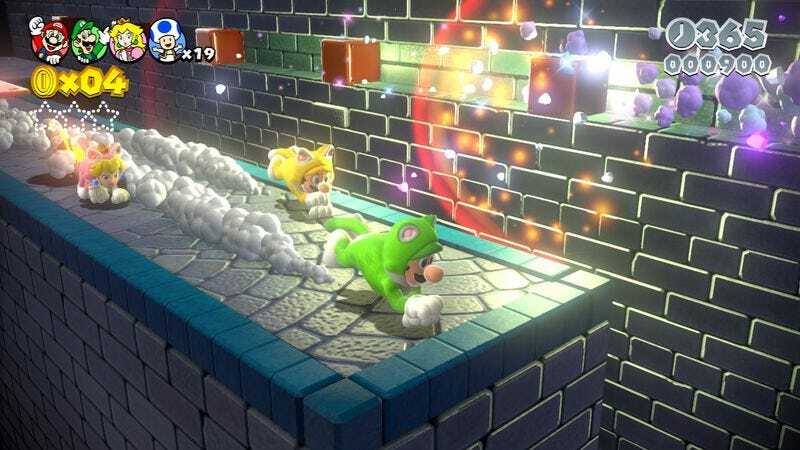 Nintendo made a big deal out of multiplayer in New Super Mario Bros. Wii, but in practice, it wasn’t very much fun. Sure, it was funny for everyone to stumble over each other. It was funny for about 10 minutes. Then it was just annoying. 3D World gets it right. Everyone has enough room to roam, it’s easy and fun to work together, and the camerawork is mostly excellent. And as a result, the physical humor isn’t such a one-note thing. But it’s the small details that have enraptured me the more time I spend with the game. I mean, each spot on the map is a little diorama-type representation of the level you’re about to play. Those dioramas are so detailed, and they are gorgeous. Then I noticed the other day that when you get close, each of the dioramas plays a little sound effect that pertains to the level. It’s subtle. Anna and I finished the game without even noticing it. But it’s there. MG: I had no idea! JT: There are so many details like that. The little 8-bit Luigis that occasionally pop out of coin boxes are another one that just wowed me. I took that as a sign that the development team was having fun with this one. When I used to do improv comedy, one little tip that stuck with me was, “The audience can tell when you’re having fun, and it makes a huge difference.” Well, Nintendo is having fun here. And I love it. MG: That’s always good advice for anyone who’s trying to entertain. JT: Yeah. Unless you’re doing Hamlet, I guess. MG: I’d say Nintendo seems to be having more fun with their stuff just in general. JT: I think you’re right. It’s exactly what they need. Now if people would just notice. You posted some of those videos they’ve done, like using Donkey Kong to scare the crap out of kids. It feels like the whole company has loosened up a little. Which is hard to do when everybody’s predicting your imminent demise. MG: Exactly. It’s almost odd to see given the less-than-ideal position they’re in. They’ve started putting out a lot of smaller games, too, and those have been some weird experiments. There’s that NES Remix series, which isn’t all that great, but it’s taking a different approach to their history. And it’s a much more lighthearted and appropriately reverent way to look at their video games than just a digital re-release or something. JT: I love experiments like that. Nintendo is an experimental company at heart. That’s why it was so irritating when Nintendo got so stuffy and predictable during the Wii U’s peak—when they apparently thought that they had to sober up in order to keep this suddenly wider audience. It was a betrayal of the company’s spirit. MG: And then they put out a 3DS free-to-play game where the more you play, the more of a washed up baseball-playing dog’s story you get to hear, tales of divorce and all. JT: I think you and I first noticed the change when we were playing Game & Wario last year, which is another Wii U game that I’ve praised within an inch of its life on Gameological. The WarioWare games have always been odd, but the strangeness went up to another level in Game & Wario—and more to the point, it was a game on Nintendo’s flagship home console, half a year after launch. I didn’t expect all the wackiness. When you read about the Nintendo of the early NES era, what always strikes me is what a mess the whole operation was. I mean, the American Super Mario Bros. 2 was this re-skinning of an unrelated game. That’s insane. Can you imagine something like that happening today? But Super Mario Bros. 2 is an appealing oddity. The messiness was good. That’s also why I didn’t care for that “Here’s the official chronology of Zelda!” book that came out a few years back. Hyrule Historia. It attempts to unite the Zelda canon, I guess, which I found to be a fool’s errand, in addition to the book simply being dull. There’s no canon of Zelda. That’s part of the beauty of the mythology. If you iron out the wrinkles, you lose the texture. Nintendo spent a few years trying to iron out its wrinkles. Now more of their games have texture again. That makes me really happy. MG: It’s been a pleasant surprise. Even their more cut-and-dry series like Mario Kart and Super Smash Bros. are looking good. Granted, we don’t know how the latest games will turn out, but everything we’ve seen so far is promising. JT: Oh, man. I can’t wait for Mario Kart 8. And I say that as one of those assholes who insists that the original Super Mario Kart was the peak. If they ease off a bit on the rubber-band A.I., I will be floored. They won’t, but it would be great if they did. MG: And, for God’s sake, the trainers from Wii Fit are going to be in the next Smash Bros.
JT: Yeah. Wasn’t that funny? MG: That announcement got the biggest reaction from the crowd of games press people Nintendo corralled into their E3 booth last year. Mega Man? Pffft. Whatever. Wii Fit trainer lady? What? That’s awesome! JT: You’re right! I hope the Nintendo folks noticed that reaction. They got a rise out of people because it defied expectations. This is all speculation, but I also get a subtle sense that the company is trying to move beyond its Cult Of Miyamoto vibe of recent years. Super Mario 3D World does not feel like a Miyamoto game, and that works in its favor. But maybe I’m just tired of Nintendo trucking him out at every E3 to speak truths unto the masses. MG: I think they’ve said he’s working on something new and Wii U-specific. We’ll see. JT: He can take his time. Keep setting the Tokyo teams loose. MG: I just want them to throw money at the WarioWare/Rhythm Heaven team. Let them make a Zelda game or something. JT: How awesome would that be? I would love it.